Note: 3 days after my birthday, lol. Aiga's battle with Phi is set. Alongside his friends from Beigoma Academy, Aiga begins his training to defeat Phi. But against Phi's incredibly powerful Dead Phoenix, Aiga struggles to find a trump card. Suddenly, Shu Kurenai appears at Beigoma Academy! Shu gives Aiga a test on how to beat Dead Phoenix, but will Aiga be able to pass? They all Unite against Ultimate Destruction? This must be the final Achilles model in the series. As B-133 DX releases this march at the same month as this episode. If I’m correct, the post shown back then describing an attack type layer that can be combined with a Defense type layer or a stamina type layer to become a balance type layer must be this beyblade. However, since this energy layer is based on combining an attack type energy layer with others, it shouldn’t be an Achilles at all. This could turn out to be a brand new beyblade energy layer as a whole. (Feb. 09, 2019 2:45 PM)IronFace879 Wrote: This must be the final Achilles model in the series. As B-133 DX releases this march at the same month as this episode. Also we just got Cho-Z Achilles. To be honest I have no idea what idea I came up with. I really want to see Dead Phoenix use 11 Turn Zepher'. I can imagine Achilles knocking the armor off and then the hexagons light up as it crashes into Achilles. (Feb. 09, 2019 8:21 AM)DranzerX13 Wrote: 48) Our Beyblade! I disagree with you. Why new Achilles? Like someone said earlier we already got Cho-Z Achilles and there is no possibility Aiga will get another chance to revive Achilles. (Feb. 09, 2019 8:23 AM)Adarsh Abhinav Wrote: They all Unite against Ultimate Destruction? Prolly just a filler episode to make Aiga ready for the battle against Phi yk happened with Valt vs Lui, and Valt vs Spriggan finales. The name “our beyblade” is probably meaning to represent how Valt and Aiga told Phi that breaking beys is not the way to beyblade. Therefore I think this episode will be Aiga fighting Phi in order to fight for justice in the beyblade world or something like that. (Feb. 10, 2019 9:22 PM)Zeutron Wrote: The name “our beyblade” is probably meaning to represent how Valt and Aiga told Phi that breaking beys is not the way to beyblade. Therefore I think this episode will be Aiga fighting Phi in order to fight for justice in the beyblade world or something like that. I'm still confused over the final finale battle the battle taking episodes 50-51. Is it Phi vs Aiga, or Valt vs Aiga? It's usually the bad vs the good. I still can see how either can play out the finale battle, but I'm thinking it's Valt vs Aiga. Just my take. So yeah, I kinda agree with Aiga vs Phi, but I disagree that you said how they will "talk" how breaking beys isn't the way to go. That would be lame in my opinion. My bad for not being more clear, what I was meaning was that the title “our beyblade” is probably a reference to how Valt and Aiga will battle fight in order to protect the right way of beyblading. 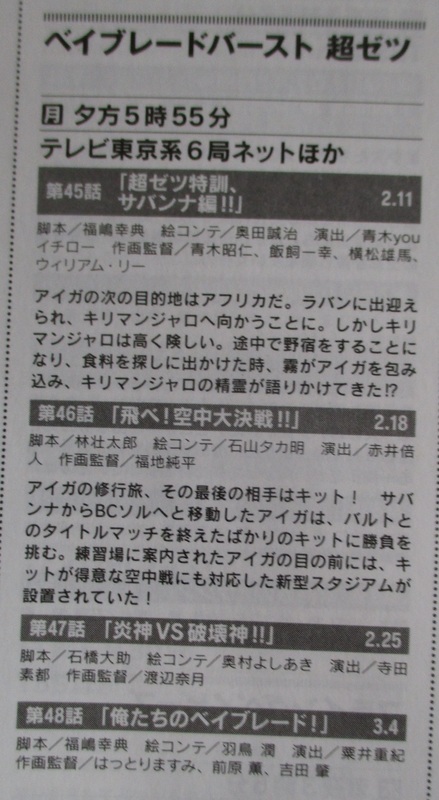 (Feb. 11, 2019 2:28 AM)Legend Red Eye Wrote: I'm still confused over the final finale battle the battle taking episodes 50-51. Is it Phi vs Aiga, or Valt vs Aiga? It's usually the bad vs the good. I still can see how either can play out the finale battle, but I'm thinking it's Valt vs Aiga. Just my take. So yeah, I kinda agree with Aiga vs Phi, but I disagree that you said how they will "talk" how breaking beys isn't the way to go. That would be lame in my opinion. Well if we're going by B-Daman rules, Phi and Aiga will be the semi finals, then Aiga vs Valt, Phi will make one ditch last move to fight, and Aiga accepts his challenge. Wait will shu be able to fix CHo-z Spriggan or what? Will he be using Spriggan Requiem once again? I doubt it. I would like to see cho-z once again after all that happening. This order should be in correct order if we see technically. As for Bladers like Shu, Lui, Free and Valt, they are now referred as Legendary Bladers. *sighes* another freaking training episode with Ranjiro and Fubuki and all that? This just feels like a repeat of episode 42 ugh. I wish some old characters returned like Houi and Kyle or something, maybe to help Aiga even more. Ah well the Phi part looks a bit interesting. No way since that would make the breakage useless. It's just I know How to do a Click bait.